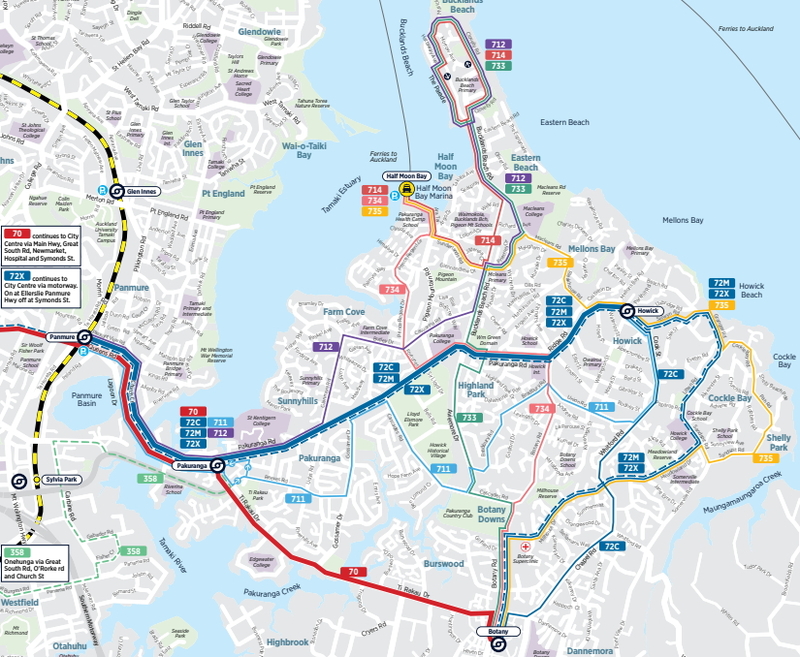 Given there’s a lot of focus on developing a light-rail system across much of Auckland at the moment, it’s worth looking at whether the Eastern Busway (formerly known as AMETI) should instead be light rail. I want to go through why, in this case, I think we should stick with the current plans of this being a busway. The need to be “mode blind” (i.e. not go in with a predetermined mode choice). Like tools, each mode has pros/cons and is better for some situations than others or sometimes the tool would be overkill for the job. Considering the network as a whole. By this I mean that the best option for this corridor could be a more expensive mode, but spending so much money on this option could mean we can’t do a more important project elsewhere. Furthermore, we need to ensure integration with the rest of the network so we don’t ruin create inefficient operating patterns or overload other parts of the network. So what does this all mean? Well sometimes this means the solution is heavy rail, sometimes light rail, sometimes a busway or bus rapid transit. It could just simply mean increasing the level of service of the bus route or improving walking/cycling. So back to the question at hand; why for the Eastern Rapid Transit corridor is a bus-based solution the right one? One of the unique parts of this corridor is that it intersects with the Eastern line at Panmure, which means we can leverage the heavy rail network in a way not possible with many other corridors. By turning Panmure station into a good rail/bus interchange Eastern users can transfer to the rail network for a short trip to town. This means only a very limited amount of buses per hour need to continue to the city. This is a key point, as a result, this corridor, unlike others, does not have the capacity constraints at one end. For other major corridors, city centre street capacity constraints are a major reason a step change to more spatially efficient modes like light-rail is required. As a result of this, the level of buses that can be run compared to other corridors before reaching capacity is quite large, allowing a bus-based solution to deliver a quality service that can meet the demand without requiring the modal step change. While transfers are a feature not a bug of a best practice transit network, creating unnecessary transfers is still not ideal. One of the big issues is that if we built it as light rail instead, is that unless we went to the huge added expense of taking it all the way to the city, would be that you are likely to be forcing transfers for many potential users. People from areas northeast of Pakuranga would end up needing to catch a feeder bus to the light rail, then catch the light rail to Panmure to then transfer to Eastern line. The great benefit of the busway and bus rapid transit for this corridor is they can all use this infrastructure easily with much more single transfers instead of multiple. Apart from not having to build a corridor all the way to the City, realistically if you were to build eastern light rail you would also need to build it along Pakuranga Rd as well as Ti Rikau Dr, simply to try to reduce the level of transfers needed. That’s roughly doubling the length of rail that would need to be built. The money saved from doing a busway instead of light rail to Botany also makes the funding of the upgrade of Pakuranga Rd to Bus Rapid Transit as well more feasible. So there are a few reasons why a bus-based solution can deliver a great service for East Auckland and is a great example of showing how each mode has its place in the network. Rail is awesome but it is not the answer to everything. There is not one mode to rule them all! Same reasoning applies to extending it down from Botany to Manukau Centre. Currently the biggest hub at the Botany end is Botany Shopping Centre. The car park of the Botany Shopping Centre. You aren’t going to force too many more buses in there easily. Sorry, can we talk about the most obvious issue here? Pakuranga Road absolutely should be part of the initial plan. Not only because it links through to Howick (which actually is capacity-constrained but that’s an argument in itself), but because of what is along Pakuranga Road: St Kents, Lloyd Elsmore, the turn-offs for the Marina and the waterfront, etc. Not doing so means you have an Eastern Busway that is effectively Eastern in name only. I suspect Pakuranga Rd will have bus lanes before the Eastern Busway is opened. Well reasoned. It’s a feeder network, so only buses can get into the suburbs where journey’s are starting. Light rail is yet another mode to transfer between. I used 711 bus this week to get home: bus was already waiting at Panmure, bus stop 100m from front door. Ideal service that light rail could not achieve. By focusing on the Panmure – Pakuranga section of the proposed Eastern Busway I think you are narrowing your focus too much. Your thinking seems to be suggesting that the Panmure station should be a terminal or continue to the city. But if an Eastern Light Rail line was to continue on cross town to meet up with the proposed Airport line and then on out West as well as in the other direction through Howick, Botany and Manukau and then to the Airport this would given a great Light Rail system connecting major parts of Auckland together and interconnecting with Heavy Rail plus feeder bus services. Your thoughts about a cross town light Rail from Pakuranga mall, to Sylvia Park, to Onehunga along existing SE highway and link it up to the other cross town suggestions that Harriett put up a few days ago heading out West? I think that if cross city rail is a possibility, then it changes everything. Could we actually have a light rail network directly connecting east and west both to the CBD and the airport? Light rail all the way to Howick and joining the upgraded Onehunga line probably at Penrose would open up so much of Auckland to public transport users, and here we may have a once in a generation opportunity to achieve this transformation. For many there will still be feeder buses, but many others will also be to walk or bike to Howick and Botany town centres for a one seat ride to almost anywhere in the city (especially when we extend light rail with a couple of Northern lines as well). I’d never heard of cross-town rail as an option until this year but what possibilities it brings! Another idea to link up the crosstown is going via Station Rd at Penrose station, cut across Gt South Rd and across Penrose Rd down towards Waipuna Rd and towards Pakuranga across Waipuna bridge. Peak hour traffic is getting worse and worse along Penrose Rd, clogging up at Penrose Rd, Mt Wellington Highway corner. Perhaps a LR stop there at the corner, and one outside Waipuna lodge given it’s a highly used conference/function centre. Cross-city light rail is an attractive idea, but going via Penrose Rd and Waipuna Rd would mean no transfer to the Eastern Line. Surely we should be building easy connectivity into our expanding RTN network? Or would you build a station on the Eastern Line where cross-city light rail crosses it? Without the constraint of the CBD it will be possible to run articulated buses on this busway, which will help speed up unloading and potentially loading. I have to agree with other commenters on here: the busway should run on Pakuranga Road too. A busway is the right tool, but we need two of them! Light Rail from Pakuranga, to Sylvia Park, to Onehunga along SE highway and connect up to Harriett Gale’s other proposal about LR to West Auckland? Changing from bus way to light rail now would just delay the project more. The need is critical now. I understand it’s being held back until the CRL is complete to avoid overloading the eastern line with passenger growth. I was thinking about the lack of train conectivicon from the East to Newmarket and the Western Line. If AT percists with the proposed purple line, I think the southern terminus should be Pamure rather than Otahuhu. Maybe could work with a third main as far up as Panmure, but perhaps just upping frequency all round is more important. Begin with the end in mind, said Stephen Covey. What’s the goal here? Pakuranga-to-CBD-via-Panmure lens is the wrong lens to view this problem, or opportunity. But part of a future Cross Town Light Rail? That sounds more like it. Get some serious congestion-free capacity across the isthmus.. run it along Greenlane, no?. This whole articles premise is based on the idea that East Aucklanders want to get to the CBD. Very few of us do…. Which makes public transport in both the current & proposed format pointless. You cannot force people out of cars & into public transport if it does not go where the people need to go, when they need to go there & in a timely manner. AT need to re-do their basic research & actually find out where east Aucklanders work & play. And THEN think about developing a functional public transport system. Linking Howick to Sylvia park, botany, Manukau, Penrose & then out west would make far more sense than blocking off 2 lanes between Pakuranga & Panmure. Quite a few of you do want to get to the CBD and to Newmarket, Ellerslie, and Sylvia Park. This busway improves the journeys to all of these locations. You mentioned Sylvia Park, Botany, Manukau and Penrose. This busway links to Penrose and Sylvia Park by allowing connections to the Eastern line and southern line. AT are investigating another rapid transit line from Botany to Airport via Manukau as we speak, with Howick already linked to this route by a regular bus service. This route’s premise is the idea that many of East Auckland’s residents travel from East Auckland to the isthmus for work, play, and study and that travel involves travelling over one of two bridges. A busway makes that connection far more productive than two more traffic lanes would. Good thing that trains don’t just go to the CBD then.